So you’d like a job in the shooting industry? Looking for a position with responsibility? Well how’d you like to help run the NRA’s High Power Shooting Program for the whole darn country? That’s enough responsibility for a lifetime, we figure. This is the real deal — we kid you not. The NRA is now seeking a National High Power Rifle Program Coordinator to work at NRA Headquarters in Virginia. The job description says the High Power Coordinator, in coordination with the High Power Manager, will “assist in the daily management of all traditional High Power programs and High Power Tactical programs.” This is a full-time position. 1. Assist the Manager in compiling and maintaining complete and accurate National Records and assumes the responsibility of initiating the National Records procedures. 2. Accurately maintain the database of Honorary Club Awards and provide accurate and timely recognition thereof. 3. Provide input to the establishment of a departmental budget as directed. Such input is based on participation in departmental activities that require budgetary support. 4. Assist in maintaining the departmental inventory and ordering of awards for High Power Rifle Championships and achievement programs as directed. 5. Research, compile, review, edit and draft program promotional materials as directed. 6. Work within traditional NRA High Power Rifle programs to bring in new equipment and courses of fire that will enhance the existing programs and increase participation. If you are interested, CLICK HERE for more information and to submit a resume. 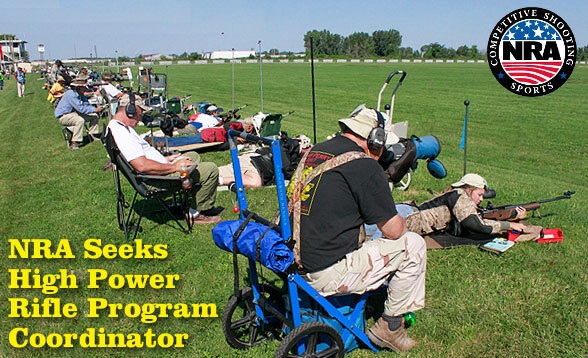 Share the post "Dream Jobs: NRA Seeks High Power Rifle Program Coordinator"
Carl Bernosky has won the 2011 NRA National High Power Rifle Championship with a final Aggregate score of 2393-160X. Rodrigo Rosa finished second, just three points behind, but Carl had a huge edge in X-Count, 160X for Carl vs. 132X for Rosa. Over the course of the past week, while amassing his winning Aggregate, Carl won a number of trophy matches without dropping a point, including the Scott Trophy Match (200-15X), Appreciation Cup Match (200-18X), Crescent Cup Match (200-15X), and the Crowell Trophy Match (200-17X). Shooting for Team SOG in 2011, this win marks Bernosky’s Ninth National High Power Championship*. This was a sweet victory for Carl, as last year he finished just one point behind 2010 Champion SGT Sherri Gallagher. As far as we can tell, Carl’s 2393-160X was the second highest National High Power Championship Winning Agg in history, exceeded only by Gallagher’s 2396-161X record set last year. Congratulations to Carl for his impressive victory! Now a nine-time champion, Bernosky has won the High Power Championship in 1977, 1978, 1979, 1980, 1992, 2000, 2007, 2008, and 2011. *In 1981 Carl won the Match Rifle division, but D.I. Boyd, a Service Rifle shooter, had the highest overall Aggregate. In this video from the 2011 Crowell Trophy Match segment of the National High Power Championships, Carl Bernosky (in maroon shooting coat) shoots prone with his AR spacegun. Note the minimal recoil after shots. Below is a video interview with Carl Bernosky recorded at the 2010 Shot Show. Carl explains when you need to shoot fast, and when you need to be patient and wait for the conditions. Share the post "Carl Bernosky Wins 2011 High Power National Championship"